Within the last couple years I've become a coffee snob. I never used to understand the people who refuse to go to Starbucks and spend $20/week on bougie hipster coffee. But now....I get it. I've become enlightened. I don't know what switched in me but suddenly I find myself only grabbing a Starbucks if it's the only thing I get my hands on, and I will not go NEAR instant coffee. I even bought myself a copper French press (who am I?) and...prepare yourselves...I stopped putting sugar in my coffee. I have not elevated to a point where I drink it without milk but, sugar in my coffee is a special occasion as opposed to a regular thing because I actually like the taste. Weird. 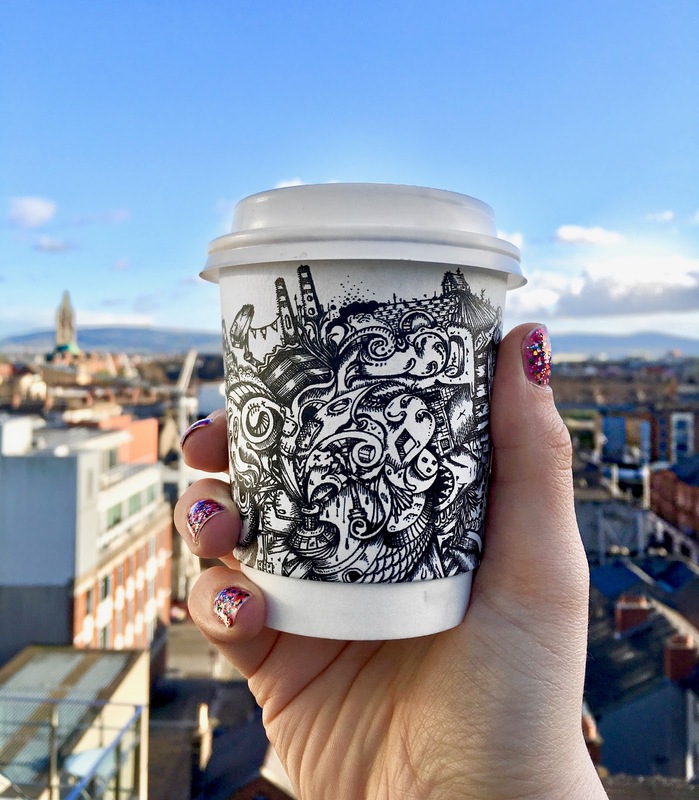 It seems that Dublin has become enlightened along with me as within the last 2 years Dublin's coffee game has gotten STRONG. There is some seriously good brew around here, don't let anyone from a "coffee country" (looking at you, France and Italy) tell you otherwise. I've had coffee here that is easily on par with the coffee I've tried elsewhere in Europe! So I've compiled a list of my go-to places all around the city, along with my drink recommendations. Note: I like my coffee smooth and creamy, NOT acidic and bitter, so keep that in mind while reading this. Also, I have tried both the regular and decaf versions of the coffee served at ALL of these places. It's important to me that the decaf is just as delicious as I often order decaf for health reasons, so if you're the same way no worries, I got you! This place can be hard to find because it's actually a coffee shop within an event venue - while you're on Abby Street, look for a sign saying "Wigwam", walk in and you'll see the neon Vice Coffee sign to the left. Their atmosphere is funky and filled with disco balls, their seats are plentiful and cozy, you'll never have to hunt for an outlet for your computer AND their food and sweet treats are equally as good as their coffee (their steak sandwich and Guinness cake are to die for). If it's a nice day, have your coffee on their cute rooftop and enjoy the sun! I have a love/hate relationship with this place. On one hand, it's probably my favorite coffee of them all. I get ACTUAL cravings for their brew. I will walk far out of my way to get my hands on this stuff. But their actual space, I cannot stand. Sure, it's in a prime city center location. But the inside of it is cramped with no real style or decor. It has major hipster vibes without the well curated space that you'd expect a hipster coffee shop to have. Good luck getting a place to sit, even in their upstairs area. Oh, and there is ONE. FREAKING. PLUG. in the whole shop. Ridiculous - but not ridiculous enough to stop me from going all the time. Needless to say, this would be a place I recommend for a take away coffee! This place is my local haunt so it has a soft spot in my heart. I definitely go here more than all of the other shops combined. It is literally a hole in the wall attached to a vintage store, but it's sooooo good and has such friendly baristas. Their sausage rolls, soups, sandwiches and cakes are also ALL delicious and insanely well priced. No indoor seating, but if it's nice out the tables and chairs they have outside are lovely. This place is often overshadowed by Proper Order Coffee (its much popular and better looking neighbor) but I beg to differ with the critics - this place wins hands down. When you're in Smithfield, look for the little blue nameless coffee station and you're at the right place! Now, I've never had a coffee from their city center location, but their HQ in Blackrock has copper lights, artisan chocolate and a wall full of snacks and goods. It's a real looker, and a great place to stop in after a browse through Blackrock Market. They also have been known to produce some pretty sweet latte art! No great seating for working but a perfect place to meet up with a friend. This place has a lot of locations around the city center so the seating/vibes/outlet situations vary, but the coffee is always nice and it's a great place to pop into while it's raining. Pro tip: sign into their wifi, wait an hour, and you'll get an e-mail for a drink of your choice! It only works once so use this knowledge wisely. This place is a relatively new discovery that I've fallen quickly in love with. Be warned, it's not in the nicest area. I say that gently because it's truly not THAT bad, but you will definitely see guards driving around, homeless people asking for change and people making secret deals in alleyways. Last time I was there someone had lit a massive fire in the middle of the road. So in typical hipster fashion, this place is a diamond in the rough. Lovely interior, cute cups, great coffee, and apparently a crackin' brunch - though sadly I have yet to eat here! If you're getting a coffee to take away, do yourself a favor and stop at the Dublin Cookie Company up the road. They make a perfect afternoon treat combo! This place is easily the winner of most hipster coffee joint. From the minimalist decor to the location in trendy Stoneybatter, it fits the bill. But there's no denying this place is adorable and serves a mean roast. If it's your first time visiting you might have trouble finding it as they're often changing the name on their famous black & white sign. I've seen it say anything from 'Love Supreme' to 'Coffee' to '....?' (literally) so keep a keen eye! When I first went to Ernesto's I really disliked the coffee, but recently they've changed their supplier and it. is. GOOD. It's such a cute place so I'm so happy they've changed their game! I've never tried their food but it also looks delectable. A place I'm now always happy to stop at when I'm in the area! Here's a map showing all of the places mentioned so you can see what's closest to you! Enjoy!